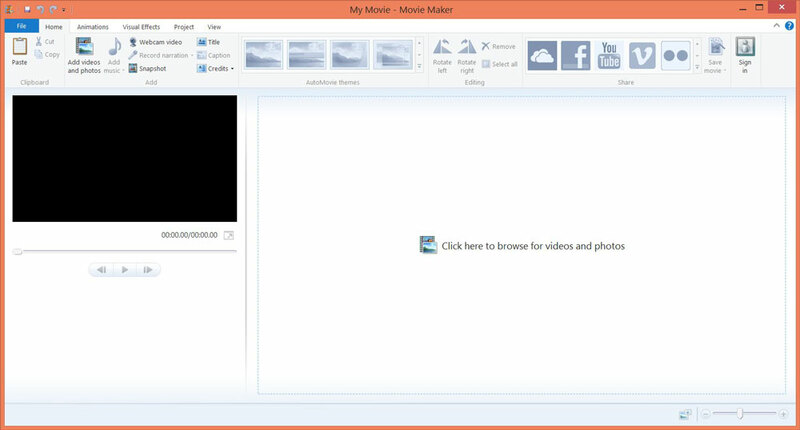 "Enhance your home made videos with Windows Movie Maker." We record tons of videos on our cameras, phones, and tablets that we either save to watch later, share with friends, or sometimes do absolutely nothing with. And they're usually left in their raw form, original footage. We can do a lot better. Why not bring your videos to life and provide yourself, your friends, and your family with something better? Provide a rich experience by adding simple transitions, effects, and text to your videos. You can do that and more with Windows Movie Maker. It is clear that Windows Movie Maker is not the best solution for making beautiful videos that are going to truly 'Wow' anyone, but that isn't what it is for. It is meant to be simple and useful to even the novice of computer users. And it does that very well. Users are even provided with quick access to post to their favorite social networks like Facebook and YouTube right from within the application. The interface is very light and simple, however there are more features than you think and more than what is initially presented to you. As you use different features throughout the application, even more sub features are presented to you that allow you to take your video editing one step further. Note: The installer for Windows Movie Maker is bundled into the Windows Live Essentials package from Microsoft. If you would like to only install the Windows Movie Maker application, you must select it via the custom install feature of the installer.